On Saturday, September 27, 2014 the City of Waycross and the “How Big Is Your Dream? 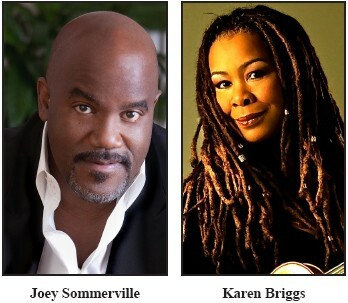 !” Foundation presents the 6th annual JFly Music Festival with special guests Karen Briggs, Marion Meadows and Joey Sommerville, held at the downtown Phoenix Park, in Waycross, GA, from 4pm – 11pm. This free festival will provide the city of Waycross and the surrounding metro areas in southeast Georgia, with a diverse showcase of international artists that have graced the stage alongside celebrity drummer, Jorel “JFly” Flynn. The theme for this year’s festival will incorporate the meaning of “Caravan of Love”, (in correlation of the popular song, by the legendary group The Isley Brothers). JFly is extremely passionate about bringing people together from all walks of life regardless of race, creed, religion and gender. Given the current state of the social division that has occurred throughout our nation, JFly is advocating unity and togetherness for all; thus the purpose of the theme “Caravan of Love”. For the past six years, JFly has assembled a family fun-filled environment for his hometown and community of Waycross, to bring forth the vision of his nonprofit organization “How Big Is Your Dream? !” (HBIYD) – introduce cultural music diversity to the youth and the community. Along with producing his annual festival, JFly has cultivated relationships and opportunities throughout the state of Georgia. Recently his foundation has been honored with a proclamation issued by DeKalb County, making June 28th as “JFly and How Big Is Your Dream?! Foundation Day”. He has also been elected “Governor” on the Board of Governors for the National Academy of Recording Arts & Sciences, Grammy Atlanta Chapter. JFly has made recognition in Atlanta for being, the first Music Director for the Annual Centennial Olympic Park’s 4th of July Celebration, and fourth consecutive music host for the Wednesday Winddown Finale. With his continued hard work and accolades for his humanitarian efforts, JFly assures fans, “Those that experience the festival will never be the same. It will be an awakening experience full of diversity and culture. Together, we will celebrate the preservation of the Cultural Art community,” states JFly. Featured performances include: JFly and The Fly Trap, Marion Meadows, Karen Briggs, Bob Baldwin, Jeff Bradshaw, Joey Sommerville, Marcus Anderson, Jeanette Harris, Terrell Carter from “Think Like A Man II”, UK Artist: Christian Jones, Rahbi and Beau+Luci. Sponsors for the festival include: the City Of Waycross, Coca-Cola, Vyve Broadband,McDonalds of Feys II Management, Flash Foods, Georgia Power and SmoothJazz.com. HBIYD foundation is requesting nonperishable food items to be donated in conjunction with local Artist’s, Beau + Luci’s OneHeart food drive. The festival will take place rain or shine at Phoenix Park. For more information and bus transportation, visit: www.howbigisyourdream.org .